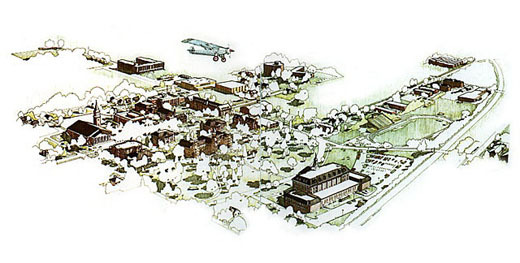 Randal did his first map for Wheaton College through Rich Nickel Design in the early 1980’s. Also contributing to the project as a writer was Amy Wolgemuth. This original art was done by hand at 20 x 30 inches in size on hot press illustration board. The line art was done with very thin Rapidograph ink pens using sepia ink. The shading and toning was added with color pencil. The aerial perspective was then drum scanned and printed in 4 color offset process in an interior spread for the Wheaton College Viewbook. For this familiar with the campus, on the middle left side is Edmund Chapel (with the steeple), and on the right foreground is the large Billy Graham Center. Notice the whimsical “Spirit of St. Louis” airplane in the upper foreground to give the view some sense of depth and perspective. This was a really fun project – and the viewbook won some design and writing awards!